UPDATE: Our guest post submissions are currently closed. We are re-evaluating our content strategy and hope to have a featured writers program up again soon. Thanks for your patience! Thank you for your interest in writing for CCG! For post ideas, keep scrolling down! 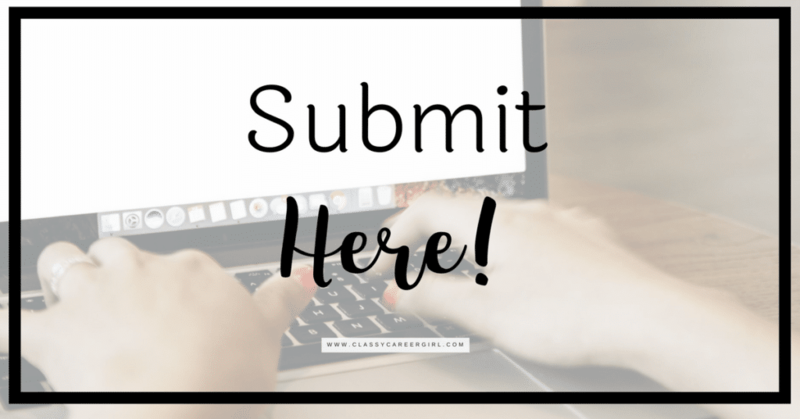 If you’re interested in submitting a guest post for Classy Career Girl, please read on and we’ll let you know what we are looking for and how the process works. We specialize in the delivery of meaningful, inspirational and beautiful content at the intersection of work, dreams and everyday life (just think a beautiful and inspiring Pinterest board for the ambitious woman). More of what you really want to see and less of what you don’t. We are passionate about creating content for women who are bored at work and need a bit of inspiration. If a million women saw one of your articles and the world would be a better place, please send it to us! A: We accept guest posts on a rolling basis, so we are always accepting guest posts. Q: How much does a guest post cost? A: Guest posting is completely free! However, please read on in the guidelines about the difference between guest posts and sponsored posts. Before you submit, can you answer “yes” to these questions? 1) If a million women saw one of your articles, would the world be a better place? 2) Is the article something you would you share if you found it online? Would your friends share it? 3) Are there enough visual elements included for someone skimming on the phone? 1) Go to our submission form. UPDATE: CURRENTLY CLOSED. 2) Include a headshot and your bio. (2-3 sentences and don’t forget a link to your site or profile). In case you’re wondering, your link is do-follow. 3) Photos (only that you have taken, or have rights to) including of products you recommend are preferred. The higher quality the better, please. We may or may not use the photo, but the better the quality, the much more likely we will be able to use it. 4) Please submit as a document (word doc preferred). 5) Article can include no links to the writer’s website (link in bio is fine, see #2). Unfortunately, a lot of authors try to use this free platform to sell their products/services. We are focused on providing great content, so reference links are fine. CCG reserves the right to make minor edits. If it doesn’t fit our requirements, we will let you know. Please use spell check and check your grammar. Content should be 500-750 words. Content must be new and original (not previously published). Since your guest article is not sponsored content, CCG has the right to take out links that appear to be sponsored/advertising. If you submit a post to CCG, do not submit it elsewhere at the same time. Once published, we cannot delete articles. Please do not submit Sponsored Posts. Please direct your advertising inquiries to info@classycareergirl.com. We pre-schedule everything at least 3 months in advance. That being said, we can still be flexible and accommodating. If you have a date you need or want, we’ll do our best to work it in. -Home Sweet Home: What do you love about your home, what décor inspires you? What makes it home to you? -Beauty: Share your go-to secrets, what’s in your work tote or makeup bag? Any seasonal items a must? -Tech: What are you dying to get your hands on? -Second Careers: Have experience or advice? Share how to job-hop after 30 years of work experience or come back after having kids. -Spiritual: Share your spiritual side because there’s more to life than this, right? What’s the meaning of your life? Why do you do what you do? -Etiquette: What are we doing wrong? Please tell us! We need to know! -Confidence: How to build our confidence and stay strong and powerful women! -Features of everyday women: Share about a friend or any woman who is doing amazing things in her work and life. Interviews welcome! -Of course business, career and job search topics are always welcome but please send us something that is unique and not on all the other blogs out there already!